the desired Nagios or Icinga installation. Note, that these credentials will be handled securely. The checkboxes near them should be checked. The component's problem(s) have been acknowledged. The component is flapping between states. The notifications for this component are currently disabled. The component is currently in a preiod of scheduled downtime. The following icons denote the different notifications appearing in the phone's notification area, and explain what they mean. The service is attempting to connect to the Nagios/Icinga server. The service has been recently disconnected from the Nagios/Icinga server. There is no network connection available, so the service is unable to connect to the Nagios/Icinga server. The service has loaded the list of hosts and services from the server. 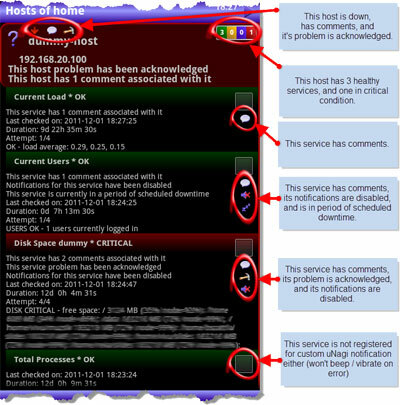 In each case above the red U means that at least one of the hosts/services is not healthy. 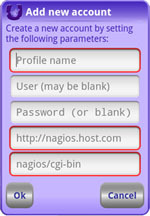 On the bottom part of the widget the name of the chosen Nagios account is shown. 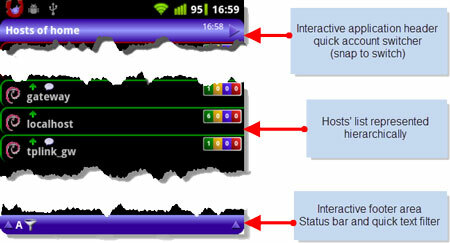 A 2x1 widget, which shows the time of the last update on the bottom part. A 3x1 widget, which shows the time of the last update on the bottom part, and if detailed host listing is disabled, also shows on the left column in parantheses, how many hosts are not parenting any services. They come in two background styles: opaque and not that opaque. If the account targeted by the widget could not be updated, and has any error information in its status, that message will appear on the widget. 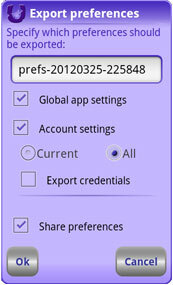 Within this section you can set preferences that will be applied globally over the application. 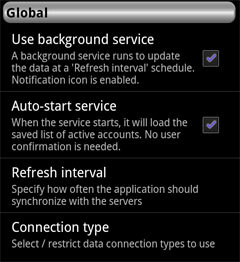 With the Use background service checkbox you can control the manner uNagi updates the active accounts, and also whether an icon appears on the notification are. 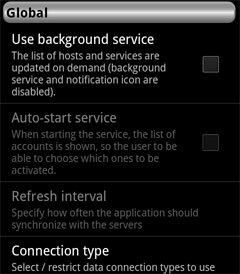 In use-service mode (when background service is enabled), by the Auto-start service preference you can control whether the application to start with the saved list of active accounts, or pop up the list of specified accounts, and let you select / confirm the ones to be active. Under the Refresh interval preference you can set the number of minutes the uNagi service will try to actualize the data of the Nagios and Icinga accounts. This is only enabled if the service is allowed to run. The Load detailed host list preference, if checked, retrieves additional information on the list of hosts, such as last check time, duration, etc. Also, the hosts that are not directly parenting at least one service, still appear in the list, not only on the notification area and widget. This feature is disabled by default, since it means more load on the data traffic. The Details font size preference allows you to increase/decrease the font size in which the service details are listed. With the Custom sound preference you can select the sound that will be played when an uNagi alert occurs. Under the Special Hours preferences you can specify the day / time intervals, during which a custom alerting scheme will be applied. This can be set via the Customize alert for SH (Special Hours) setting. 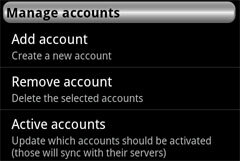 In this part of the settings you can handle the account you were watching right before accessing the preferences page. By selecting Refresh data now you can request an on demand update of the current account's data. Selecting the Update the xxxxxx account you can review the configuration of the current account, modify the access parameters, such as the host, the cgi-bin path, the user name or the password. The Filters preference lets you control which filter to be applied on the current account. This can be done directly from the Menu -> Account -> Filter by state as well: A - All, I - Issues, R - Registered. 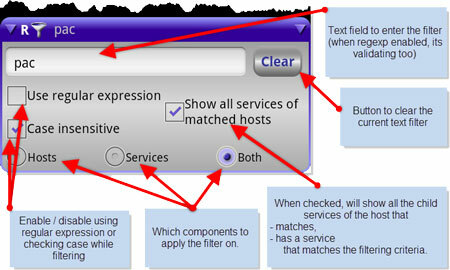 The Extend registration filtering configuration has only effect if the Registered filtering is active. If checked, allows you to list all the siblings of services that are registered, regardless whether they are not. By the Load service icons setting you can enable / disable loading and displaying the icons you've defined for individual services from your Nagios / Icinga configuration. Under the Date format preference you can specify the date-time format to be used when requesting/sending dates from/to the server. Here you can set how you want to be notified, when a service registered for uNagi alerts has problem. The Play sound and Vibrate settings are pretty obvious. They will alert you by sound / vibration, if a service registered for uNagi alert has issues, and its status level is checked in the Alert levels preference below. In the Alert levels you can set the level of problem on you need alerts: any combination of Unknown, Warning and Critical is accepted. - keep playing the alert until you check the notifications at Menu -> Account -> Load notifications. This section lets you deal with any malfunction / error / odd behavior of the application. If you feel a problem is hard to describe, difficult to reproduce, or don't have the time to drop a note about it, but still would like to make uNagi better, please just simply enable reporting, and I will look into it. Thank you very much! If you experience any of the behaviours above, please check the Enable instant reporting checkbox, by that allowing the application to send me the cleaned-up stack traces. By them I can learn what causes the problem, and if there is anything I can do to fix it / prevent it, it will be done by the next release. A cleaned-up stack trace means that it is free of any personal, sensitive information, only debug information are submitted. 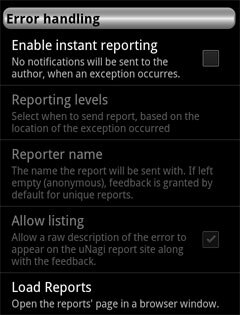 Under the Reporting levels settings you can configure from where to send reports of errors arisen: the user interface, the service or connection handling. 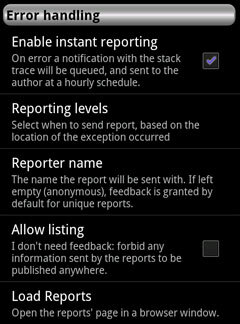 The reporter name is an optional setting, which should be filled only in case you'd like to have feedback on the problem you are experiencing. By checking the Allow listing checkbox, you allow the (unique) errors reported by you to be listed on the Reports page. If the reporter name is left empty, this setting is on by default. And at the end a pretty obvious action preference: by selecting the Load Reports, the Reports page will be opened in a browser window. At this preference section you can manage your application / account preference backups: create new ones, share them, ore restore older states. By selecting the Backup preferences item, you'll have to chose which particular data you'd like to be saved (as seen on the right image). A preference file will be created with the chosen name in the application directory, on the sd-card. You can also restore saved preferences, by selecting the Import preferences item. Only files placed under the sdcard/unagios/data directory are available to load in (at the moment).